Amazing views for this fully renvated farm on 25 acres of meadows . Limoux area . The bastide town of Chalabre, which is found nestled in the foothills of the majestic Pyrénéan Mountains in the south of France, is a true jewel of the south, with character, charm and a glorious setting. Peaceful yet with a lively and warm heart, Chalabre wins the affection of all who discover it. Chalabre is what is known as a bastide town, which is a town built to a very distinctive design. The streets radiate out from a central square following a grid pattern, and the central square, which is the hub of town life, is arcaded, often with a free standing covered market area, and is extremely attractive. Chalabre is no exception to this rule, and the market that takes place in the town's centre every Saturday makes full use of the old design to present one of the most appealing and picturesque markets in the region. Bastides were built as the "new towns" of the 13th century, built both to be defensively strong and to regenerate the regions that had been ravaged by wars. Life in Chalabre is about as good as it gets, as long as what you are seeking is an idyllic rural lifestyle in beautiful surroundings. The little town offers a good selection of basic necessities, so you can pop down to the boulangerie to buy your bread fresh and delicious from the baker's ovens every morning. There is little need to leave town unless you wish to avail yourself of the services of a larger town such as Limoux, which lies just over half an hour way and offers a large Le Clerc supermarket and many other facilities. Chalabre has the advantage of being close not just to the Pyrénées, with all the skiing and mountain sports that they offer, but also to one of the region's most famous and beautiful lakes, Lac Montbel. Lac Montbel has many water sports and leisure facilities, and is set in a truly fabulous landscape, with the white peaks of the mountains soaring above and the lush green hills of the Quercorb providing a stunning backdrop. The region is rich in history, and is a great place to trace the tragic and somewhat mythical history of the Cathars with their castles and grail stories. Visit the cities of Carcassonne and Foix, climb to the ruins of the last Cathar castle of Montsegur, or simply take the twisty roads up into the mountains and enjoy the amazing views. Not far away too lie Spain and Andorra, so there is no excuse to be bored... the world lies at your feet in this part of France! Carcassonne and Perpignan airports are both useful for those wishing to reach Chalabre from the UK. Carcassonne is served by Ryanair, while Perpignan is served by Ryanair, bmibaby and flybe. A car is recommended however, so that you can fully enjoy the area, as many towns and villages are essentially rural and without other means of access. The nearest railway station is at Limoux. Chalabre is a very beautiful but rural town, and although this is the essence of its charm for many, the fact that it is somewhat isolated from major towns and services means that prices remain lower than in more highly populated and better known areas. Whether you choose an historic town house or a country farm to renovate, Chalabre could well provide the rural French idyll of which many of us dream. Do you know Chalabre better than we do? Do you have photos of Chalabre? 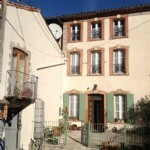 Chalabre is set in the south of France, in the foothills of the Pyrénéan Mountains. It lies in the very west of the Aude department, close to the regional border with Midi-Pyrénées. Access: By air: Fly to Carcassonne or Perpignan. By road: Chalabre is accessed from the D16 then the D620. By rail: There is a railway station with links to Carcassonne at Limoux, some 35 minutes drive from Chalabre. Economy: The economy is mainly based on agriculture these days, with fruit growing important. Interesting fact: The Quercorb region, in which Chalabre lies, is sometimes referred to as the "terre priviligée" due to the fact that in 1210 the King of France made the area exempt from certain taxes.